Mr de Causans told the French daily Le Parisien that it was a matter of family honour to rectify the “trickery”. In a video broadcast by Le Parisien (in French), Mr de Causans said “I want the truth to come out – I want reparation for the injustice done to my family by France”. His lawyer, Jean-Marc Descoubès, told the BBC that “on 2 July this year we asked the foreign ministry to pay compensation to my client”. The ministry has two months to accept or reject the request, so the deadline is 2 September. “If the government refuses we will sue it in court,” he explained. But in 1911 a law was passed, under French pressure, changing the rules so that Louis could reign. He had an illegitimate daughter, Charlotte, and the new law enabled her to be adopted by Louis, thus getting round the succession problem. Charlotte was born of a passionate liaison between Louis and a cabaret singer, Marie-Juliette Louvet. At the time the great European powers were in an arms race that turned into the carnage of World War I in 1914. Mr de Causans says the succession should have gone to a German nobleman from his own branch of the family – Wilhelm, the Second Duke of Urach, who was Louis’ cousin. The lawyer, Jean-Marc Descoubès, said that “it was quite simply unacceptable for a German to reign over Monaco then, on the eve of the First World War”. “We identified the responsibility of the French government,” he told the BBC. When asked why Mr de Causans had only decided to make his claim now, he said the late Prince Rainier III – Albert’s predecessor – had “blocked everything” during his reign. He died in 2005. 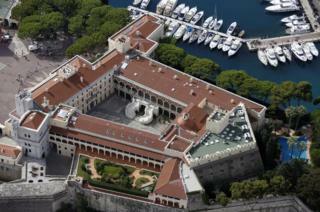 Rainier had barred Mr de Causans and his side of the Grimaldi family from entering Monaco, the lawyer said. The €351m figure for the claim resulted from the calculations of lawyers and accountants, based on the Grimaldi fortune and Mr de Causans’s age, he said.